The Dr. Jill's Felt is our pick for the best metatarsal pads, in which the felt is made with a size of 1/4 inch so it will fit on most feet. It has an adhesive back so that it stays in place no matter what position you are in. The ergonomic design also helps to support you all the way. Our step-up pick is the DR JK- Ball and it is very comfortable in its design. It is made with medical grade gel that is soft, squishy and flexible. 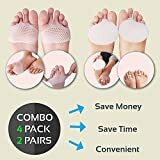 It is made for those with aching feet, neuroma and other foot pains. It can also work for people with metatarsalgia. The budget pick is the HappyFeet Ball and this one is also adhesive and self-sticking so it is very easy to use. Each pad can be reused a lot and it can be used for those with metatarsalgia as well as other foot problems like neuroma and other foot pains. A metatarsal pad is a kind of pad that is worn on any footwear, such as your shoes, and aimed for the metatarsal bones of a person's feet. It is a kind of pad that you will need to have if you have suffered injury for your metatarsal bones, which is especially the case if you put up with a lot of physical activities, such as running, jogging, aerobics or sports. People who do sports a lot that involves a lot of footwork, such as basketball, boxing, taekwondo, soccer, figure skating, winter sports, track and field sports and even dance sport or ballroom competitions, may experience pain and fatigue on their feet if they play too much without resting. If you settle with high intensity workout and training all the time then that can also potentially leave you injured, especially if your exercise or workout has mainly a lot of footwork involved. To survive your injuries and get the support that you need, you may need foot pads for your feet to make sure that even if you are wearing your shoes, you will stay comfortable all throughout your day. If you get injuries, then it is best to leave it to an expert to take care of it better. This is because if you medicate yourself and you don’t know what you are doing then you could possibly get even more injured or worsen the injury in the process. Therefore, you should definitely consult and seek the help of a professional if you think that your injury is not leaving you. Oftentimes, orthopedic pads are needed by those with problems on their feet. This is because they can do things much better in life if they have support for their feet, so that they do not make you feel uncomfortable if you have something that is wrong with your foot, such as plantar fasciitis and the like. Size of your feet: you have to measure your feet so that you will know how big or small the pad should be. The size should be right so that it will not lack in protection and it will not be too suffocating for you to wear overall as well. There should be many kinds of sizes out there that is available for you to buy. Ease of wearing: the support should be very easy to put into your footwear so that you can use it right away without worrying about getting frustrated. The design should be easy to fit so that you can wear it while you are putting on your shoes or some other footwear. Materials used: the materials that make up the foot support for your upper feet joints should be durable and will not easily get squashed by your feet when you are using it on the go. Hypoallergenic: it should be made of materials that are not going to cause some sort of allergic reactions to your skin so that it can be worn for as long as you like without worrying about sweat and moisture. This will be a very important case to consider if you are one with naturally sensitive skin. Number of pads in one pack: some packs have more than just one pad in one pack, allowing you to save more money in the long run, in which you don't have to buy them more often. This is most likely the case if you frequently need or use them, usually for athletic injuries and concerns. Stays in place: you have to consider one that stays in place all the time until you take it off so that you will not feel awkward when you wear it all day and all sorts of things with your feet. Wearing foot support is different from just wearing your socks because they will have the factor of moving around. Comfort factor: they should also be comfortable to wear so that they will feel natural and as if you are not wearing anything. As supporting tools that go under your feet, you should consider one that is not too hot or too cold to feel when worn in your shoes or other footwear. 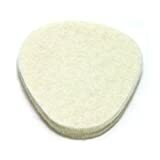 As our top pick, we chose the Dr. Jill's Felt, which can be easily installed on the ball of the foot. The felt is made with premium material and has a size of 1/4 inch so it fits comfortably. Because it is adhesive on its back part, it can be easily installed onto your footwear such as your shoe or sandals with great ease and without moving so much. Each pack comes with 10 foot pads in total and each of them have a size of 2 1/4 x 2 3/4 inches. If your feet also often slides forward in your shoes, this is a great tool to keep that from happening. It can bear a lot of pressure on your foot part. Most podiatrists have recommended this product very well for patients with foot concerns. The only con but not a deal breaker with the Dr. Jill's Felt is that they may be too thick for most shoe sizes, but this is a case to case basis. As our step-up pick, the DR JK- Ball can be used by both men and women due to the universal design that will adhere to the shape of your feet regardless of gender. It comes in 2 pairs for you to use and it also comes with other accessories, such as a forefoot cushion and others. The gel that makes up this kind of product is of medical grade to ensure that it is great for sensitive skin. If you have metatarsalgia, neuroma, aching feet and other foot problems then this can be a great product to use. It helps you to relieve discomfort on your feet and they are not easily seen on peep toe pumps, so you can wear them discreetly. They also work as custom arch supports as well as for those with plantar fasciitis. You can also use the cushions and pads separately for other purposes. The HappyFeet Ball is a clear gel type support and is our budget pick. This kind of product is easy to apply due to the simple and straightforward design. It is self-adhesive without the worry of skin irritation due to being made out of skin friendly material. It can be used on almost any kind of shoes due to its universal design. There is also no odor when you use this kind of product for a very long time. It will not gather odor as well when you use it, yet it is very comfortable when you reuse it over and over again. You can use it if you have atrophy, neuroma, metatarsalgia and others that might make your foot feel sore altogether. The Pedag Drop comes in a pair of 2, in which you can easily add shape and contour to your feet without getting hurt. It is self adhesive or sticking easily so that you can use it for a long time without the worry of it getting misplaced. It is perfect for walking due to the lightweight feel and the ease of use. It is great for those with spreading metatarsal arches and other similar foot pains. The materials that make up this product include vegetable tanned leather, so it is quite a vegan product, plus latex that has been tested by dermatologists to be safe for your skin. It can be used for relief from burning and stinging symptoms on your feet and they come in a teardrop shape that is very contouring. They are available in medium sizes but there are also small sizes for small feet. The Half Toe Sleeve is great for those who want insoles and support for their insoles. They come as a pack of bunion pads and cushioning support for your feet. They can be easily washed and used over and over again because they are made with TPE or thermoplastic elastomer, so that they can last for a very long time without reducing the quality and without causing skin allergies due to the medical grade material that is used for it. It comes in a set of 2 that can be used for your chosen footwear. They are soft in their gel content and can be used for patients with plantar fasciitis and other foot pains. They can adhere to most medium and small toes and even those with big feet. They can be used on many kinds of closed toe shoes and are not very slippery at all when you use them. You can also use them for ballet shoes. If you have neuroma then the MARS Wellness can be a great set of supports for you. It comes in a total of 6 pairs in one package and each of these supports have a thickness of at least 1/4 inch. It is also adhesive backed so that you can feel much more comfortable in the long run without having the feeling of your support getting loose. The design of this foot support is just right with a teardrop shape at 2 x 2 inches in its overall size. It can be used for plantar fasciitis, pain in the ball, IPKs and metatarsal problems. They can take a long time to wear out even with everyday use and they can be stuck to the bottom of your everyday orthotics. The Pnrskter Foot Cushion comes in 6 pieces in just one pack, and all of them can be used for most foot pain. They can be used if you often have blisters in your feet as well as painful callus. If you are a diabetic then this is a great foot support that you can count on. It can also be used for bunions, blisters and other problems like in your metatarsal foot area. The cellular design is unlike other competitors in the market – it makes your feet much more breathable in your shoes in the long run, making walking a breeze and making wearing shoes less of a hassle. It can also be used even when you are wearing work shoes, boots and even when you are not wearing any kind of footwear at all. It can be easily washed and cleaned and is backed by a warranty of 18 months. If you have metatarsalgia then you can count on the HAPAD 6 Pairs. It can be used by both men and women and is made from wool felt, which is organic and durable, not to mention comfortable. It has been recommended by many doctors and physicians and has a good thickness of 5/16 inch. It can be easily worn and will not easily move because of its adhesive quality. It is available in both medium and large sizes and it can also be used by people who have neuroma. Even if you do have sweaty feet, it will not be alarming for you because it will stay in place even for longer periods of exercise and workout. They can also work well even in sandals. The Lunoda Foot Cushions comes in a pack of 4, containing 2 pairs each. It can be a great choice for those who want to avoid blisters on their feet. It can also provide good foot relief and support all the way and can also act as shoe insoles. It can work on people who have tailor’s bunion, plantar fasciitis and the like. You can also use it on almost all kinds of shoes, such as half toe shoes and the like. They look elegant and non-obtrusive for everyday use and they can be easily cleaned. They are indeed flexible and can be worn even on the most casual clothes possible. If you have to wear high heels for a uniform or an occasion, the Welnove Anti-Slip Ball is a great choice for you. It is non-obtrusive in its design and it can be used for other purposes as well, such as hiking, yoga, walking and traveling. The gel is made with silica gel so it is of medical grade and will not be harmful to your skin. There are many sizes for both men and women for you to choose. This kind of foot support can be easily hand washed and it dries easily as well. It can be used for those with foot problems and the like. It is breathable, anti-odor and antibacterial in its design. You can use them with most shoes and they will feel very comfortable in the long run. If your uniform involves high heels often then you should consider this kind of support. Other pads were not satisfactory because they did not have durable materials and were also not hypoallergenic so they were not very skin friendly. They were also hard to place for most foot sizes so they may not be everyone's cup of tea. Orthotics are important for many patients because they allow the customization of their shoes to make sure that they can support them even during tough times, such as moving from one place to another, doing physical activities, recovering from an injury, doing work or school activities and the like. Orthotics get you medical help even when you are doing your daily activities. Q: Who are the people who can benefit from the use of orthotics? If you have orthotics, you can help alleviate the pain you have from a recent injury. Additionally, you can also use orthotics to help alleviate any kind of injury in your knee, which in turn, can also help with your back pain. If you are an athlete or someone who does physical activities on a regular basis, using orthotics can help you recover from injuries easily. Those with arthritis can benefit from orthotics if they have achy feet. Those with diabetes can also get the same benefit from orthotics if they have sore feet. You don’t have to have foot injury to wear orthotics – some people just wear them because they are comfortable and naturally conforming to your feet in general. Q: What are the ball of the foot parts? A: The ball of the foot part bones are the bones of your feet that make the connection between your toes and your ankles and heels. There are also five ball of the foot part bones, just like there are five fingers in your hands and five toes on your feet. They provide strength and structure to your feet in general, and are the ones that get the most abuse because they are the ones that are curved downwards from the arch of your feet in its shape. Q: What are the symptoms of ball of the foot pain? The problem with ball of the foot support item pain or injury is that you will most likely have if your feet are aching very badly. The burning sensation will last for a long time and will not only be limited to one session only, so it can be really excruciating to the ball of the foot support item. If you have pain that keeps getting worse on your ball of the foot support item when you are running, walking or simply just moving your feet or pressing onto the ground or something else, then it can be a very serious pain on the ball of the foot support item to consider, in which you may want to call a physician or get medical help. 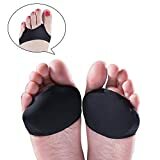 If you find that the pain of the ball of the foot support item will eventually disappear when you rest your feet, such as when you lay down on sofa or a bed, or put your feet up the table so that your ball of the foot support item does not touch anything, then that means there must be some pain on this part of your feet. 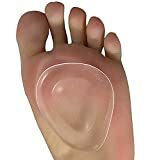 The pain can also have a sharp and shooting sensation on the ball of the foot support item, which can be very serious and can also cut you off from your daily physical activities, in which case you may really be experiencing severe ball of the foot support item. This can mean that you have overused your ball of the foot support item due to any kind of physical activity or some other factor. If the pain of numbness or tingling sensation goes into the toes of your feet, then this can be a serious problem. In some cases, the ball of the foot support item injury or pain can be characterized by that feeling that something is stuck in your footwear or shoe but there really isn’t and it is really just the problem of your ball of the foot support item. Q: What are the causes of ball of the foot pain? 1. Box shaped or narrow shaped footwear or shoes. If you have shoes that are shaped like this, then it can take its toll on your feet. The problem with these kinds of shoes or footwear is that they can potentially make the ball of the foot support item look unnatural, along with the rest of your feet. Therefore, it is important to consider lessening the amount of time you wear these shoes. 2. Footwear that are restrictive or too small. If you have footwear that are seemingly small for you then you should go for a size up. Wearing anything that is too small can make your ball of the foot support item suffer as well, so it is best to always try to consider your foot health over other things such as budget (unless you are really on a budget). 3. Excessive pressure by standing all day. Those who work in malls are definitely the target of this, and there is no way out of it, unless they get another job. The solution for this is to possibly get more rest times after their work, so that they can help their feet get better, especially because standing often in heels puts stress on the ball of the foot support item. 4. Wearing high heels more often. The problem with the design of high heels is that it is designed to put a lot of pressure on the ball of the foot support item of a person. This is why you should wear them less often if it is not required by your work, or consider going to work with a different set of shoes, unless there is a dress code, in which you should just get more rest times. 5. Engaging in physical activities that involve the ball of the foot more often. Q: How can the ball of the foot injury treated? This is described as icing the area or the ball of the foot. Ice is a great way to keep your feet injury to a minimum when it comes down to the pain and the inflammation. The optimum time is from 15 to 20 minutes, with some interval to make sure that your skin does not get frostbite. In addition to that, you should also wrap the ice so that it will not get into your skin. OTC or over the counter medicine is seen to be one of the easiest ways for you to get cure from ball of the foot part pain. This is because you can use these medicines to reduce the inflammation or pain a little bit or generally. Common OTCs that you can go for include ibuprofen, which is known to be a pain killing OTC medicine that is easily accessible from most drugstores and pharmacies. To make sure you get total and proper rest from your pain on the ball of the foot part bones, you should consider resting your feet when it is not in use, such as when sitting. If you are on your break and you are not doing anything, or if you are in your vehicle or in your house, it may be best to take off the shoes for a while to let your feet breathe, depending on the situation. You can also consider support such as ball of the foot part support items and anything that can be worn on your feet to make sure that you are kept comfortable for the rest of the day, especially if you have no choice but to wear shoes or any kind of footwear. Q: What are the benefits of ball of the foot part support items? 1. It can help realign your ball of the foot parts to the right position. 2. It can help with injuries regarding the ball of the foot parts. 3. It can help with proper toe spacing. 4. It can help with people who have neuroma and plantar fasciitis. 5. It makes your feet more naturally shaped instead of being shoe shaped. Q: How do you put your ball of the foot part support item onto your footwear? 1. Line up your insoles properly, matching the left and the right to your feet and your shoes or footwear. 2. Next, align your ball of the foot part support items so that they can be ready when it comes down to putting them. 3. Match the toe part of the ball of the foot part support item onto the toe part of your insoles. 4. Keep the left and right side matched to your support items and your insoles by looking at the arch shapes. Q: What are some common misconceptions about orthotics? Only old people can use orthotics. This is not true, because orthotics can be something that anyone can use regardless of age. As long as you want to keep yourself comfortable or want to use support items so that you can make your feet comfortable against injury or other signs of pain, you can definitely make good use of orthotics. Orthotics that are custom made and those that are store bought are the same thing. Just because it is store bought doesn’t mean you will get the same thing when you custom made it. The reason why custom made is different is because you can choose the material and the feel of the whole thing that is specifically tailored to your kind of feet and skin. Custom made orthotics can be pricey to purchase. Not really, because there are many kinds of orthotic sellers out there that do sell custom made ones for a decent price. Only people with flat feet should use orthotics. Anyone who just wants to feel comfortable after an injury or just wants to feel comfortable in general while wearing shoes or heels can definitely make the use of orthotics. Q: If your feet are sore from an exercise or sport, what are the things that you can do to help yourself recover? 1. Cold water bath for your feet – this is a technique that can help rejuvenate your feet, so that it will feel more invigorated and so that the swelling or inflammation of your feet or ball of the foot part bones can be relieved. Cold water acts like the cold compress that is used on a knee after the instance that an injury occurs or happens during any kind physical activity or sport. 2. Epsom salt with warm water – Epsom salt is always a great thing for relaxation and cleansing, while warm water is great for disinfecting your feet from the sweaty threats of mold and mildew. Your feet will also be refreshed and they will not feel fatigue if they are soaked in warm water, which can have therapeutic properties as well. 3. Foot massage – it can be done so that your feet will not fall out of shape. They are often overlooked because you need someone to do them, but actually, you can do it on your own. Just lightly pressing your feet to make the pain go away a little can be helpful, because the best person to know what your body needs is yourself – you will most likely know where the pain is and how to heal it yourself. 4. Tennis ball or foam roller – this is a great way to help your feet stay relaxed after a long day of sport or physical activity. It will act as a do it yourself massage kind of activity, especially if you have one of those foam rollers or those tennis balls at home. They are soft and can help your feet experience great relief through a series of massage like movements. 5. Stretching your feet – you can also stretch your feet after massage. It is a great way to keep your feet still in exercise mode so that your feet will not stay stagnant in place after a physical activity. Stretching your feet can also reduce the risks of additional injury later on, and is vital for those people who are suffering from such foot injury. Q: How do you prevent ball of the foot support item injury? If you pick the right shoes then you will definitely be at less risk for the ball of the foot support item injury or pain. This is because with the right shoes, you are preventing your ball of the foot support item from having a deformed shape like a shoe and instead, the ball of the foot support item becomes more natural in its entire shape. A set of breathable and durable socks can also help when it comes down to keeping your ball of the foot support item in good shape. This is because your socks will work in the same fashion as your shoes – to protect your ball of the foot support item and other parts of your feet that need protection when you are going outdoors or doing some sort of physical activity. You should definitely consider getting some rest times and break times so that you do not injure your ball of the foot support item much further. If you feel that most of the time, your ball of the foot support item is hurting too much, then you should take it easy and don’t do so much intense workout during this time, until you have fully recovered. Q: What are ball of the foot part support items made of? A: They are mostly made of wool felt material, which can come in a wide variety of designs to choose from. They have been used in the early ages of medicine for surgical purposes, and are known to be very comfortable and durable when it comes down to supporting your feet, especially your ball of the foot part bones. Q: What are the differences between insoles and orthotics? 1. Insoles are the ones that have minimal support but they can be great with comfort. They can be greatly supportive for your ankles, heels and even for your ball of the foot support item. They can be great but they are mostly breathable because they are mostly inserts that have thinner material. 2. Orthotics offer great support due to the added plastic material. An orthotic is usually much larger in size and can be custom made depending on the person. They can also help add relief to the pain of most of the parts of your feet, especially the ball of the foot support item. Q: What are the possible medical conditions associated with foot pain? Q: What are the most common types of ankle and foot pain? Q: What exercises can you do to ease foot pain? 1. Foot rolling – use a water bottle, foot roller or even a tennis ball – anything that you can roll under your arch, so that you can feel relief from foot pain. 2. Calf stretch – this one can be done by stretching your calves and holding it towards a wall or any kind of straight and solid support for up to 15 seconds on each foot. 3. Calf raising – this one can be done by raising your calf as if tip-toeing and can help with both your heel and your ball of the foot part bones to feel sturdier. Q: What exercises can I do to lose weight if I have foot pain? 1. Pilates – this is much like yoga, in which you stretch your body parts gently, creating a very relaxing atmosphere for your muscles and bones. 2. Swimming – swimming mostly involves your hands and arms, so your feet are used less. 3. Weight training – when done sparingly, sometimes weight training can help you with weight loss even if you have painful feet. 4. Dumbbells – just the same with weight training, only on a smaller scale. 5. Sit-ups – great for when you don’t want too much foot stress, depending on the intensity. 6. Push-ups – just the same with sit-ups, just don’t take it too stressfully. Push-ups mostly use your upper body rather than your lower body, anyway. 7. Resistance bands – the use of resistance bands also makes weight loss more effective even if you don’t exercise your feet a lot. Q: What foot injuries can dancers experience? Q: How do you improve your footwork? 2. Consider jumping rope exercises. 3. Go for mirror drills (with a partner). 4. Climb up the stairs sprinting. 5. Do some resistance band training. 6. Go for some ladder drills (training ladder). 8. Learn some basic breakdance moves. 9. Go for agility hurdles. 10. Do some flexibility exercises. A: A podiatrist is a kind of specialist that works to help your feet stay healthy. He or she can be a physician and/or a surgeon at the same time. Consult a podiatrist if you find that your feet are failing you, or if you suffered some injury. Most of them are certified by the American Board of Foot and Ankle Surgery as well as the American Board of Podiatric Medicine. In the long run (pun intended), we think that the Dr. Jill's Felt is our pick for the best metatarsal pads due to the fact that they are easy to wear and to stick onto your footwear. They are also generally comfortable and have a nearly one size fits all design, which can help almost all users with metatarsal problems.